The Senate Intelligence Committee’s hearing on John Brennan to head the CIA focused on lethal drones, but Brennan’s loose talk lumping Iran with North Korea as nuclear threats could be even more worrisome, recalling Iraq WMD exaggerations, as Veteran Intelligence Professionals for Sanity warn Sen. Dianne Feinstein. We write to urge you to ensure due diligence regarding John Brennan’s fitness to become CIA director before you make the next-to-the-worst mistake of your tenure on the Senate Intelligence Committee by endorsing Brennan. Your worst perhaps you will now agree was your vote to authorize war on Iraq. 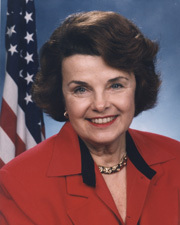 Sen. Dianne Feinstein, D-California, chair of the Senate Intelligence Committee. Brennan Now Taking Aim at Iran?â€¨ â€¨This recent history is highly relevant because, at the time, John Brennan had a ringside seat for this unconscionable charade as it was being acted out (more on that below). Of still more importance are recent signs that Mr. Brennan intends to ape his discredited mentor, former CIA Director George Tenet, by slanting intelligence to “justify” an even more catastrophic attack this time, on Iran. Whatever grounds there may be for suspicion that Iran might be seeking a capability that eventually would allow it to rapidly break out of Nonproliferation Treaty (NPT) constraints on building a nuclear weapon, there is even less evidence that Iran is seeking an ICBM capability. Iran has never flight-tested a ballistic missile with ranges in excess of its 2200-kilometer range Sajjil MRBM. Nor has it launched a space rocket that would be a suitable model for an ICBM. Conflating Iran and North Korea, as Brennan does, seems too clever by half. The Islamic Republic of Iran, as a non-nuclear-weapons member of the NPT, not only denies any intent to pursue nuclear weapons, but also declares such an intent immoral. In contrast, North Korea withdrew from the NPT after President George W. Bush labeled it one of the three points on an “axis of evil” (together with Iraq and Iran). Pyongyang declares a nuclear weapons capability against the United States essential to deter the kind of attack inflicted on Iraq. These issues have been on the front burner for years. Brennan’s statement is one of several that raise serious doubt regarding his suitability to head the CIA. It can be no secret to you and your committee colleagues that his statement deviates sharply from the unanimous, “high-confidence” judgment of all 16 intelligence agencies that Iran stopped working on nuclear weaponization at the end of 2003 and has not resumed that work. That key intelligence judgment, reached in 2007, has been revalidated by U.S. intelligence and reaffirmed by the Director of National Intelligence in sworn testimony before your committee every year since. “Fraudulent” is the inescapably appropriate adjective to describe the pre-Iraq-war intelligence conjured up by those (first and foremost George Tenet) who did the bidding of George Bush and Tony Blair. Former CIA colleagues who served under Brennan before and during the Iraq war tell us that, since he was such a close confidant of Tenet, Brennan almost certainly knew chapter and verse about the deliberate corruption of the intelligence on Iraq. And yet, we have no indication that you have investigated whether Brennan was part of that fateful conspiracy. British documents leaked in 2005 acknowledged as authentic by the UK government detailed the hoax being prepared to “justify” war on Iraq. In a July 23, 2002 briefing to British Prime Minister Tony Blair, the head of British intelligence reported that then-CIA Director George Tenet had told him at CIA headquarters three days earlier that “the intelligence and facts were being fixed around the policy” for war on Iraq. It is not too late for you to look into what role John Brennan played in these key events. Was he, for example, one of the small circle of senior CIA officials who met with the head of British intelligence on July 20, 2002? We don’t know the answer to that, but you might be able to find out if you ask. From our experience with such meetings, it seems likely that either Brennan or his boss A. B. “Buzzy” Krongard would have been among those taking part. You could ask each of them. You should be able to expect straight answers. Whether Brennan was in the loop for the lies on Iraq is not an idle question, impinging as it does on his integrity. And yes, integrity matters. It matters a great deal. Why not instruct your staff to determine how many fraudulent-intelligence-related memos Brennan received, just as they did in identifying at least 50 torture-related memos that show him to have been “in the loop” on that sensitive subject. This is a far cry from what Brennan admitted to namely, just having had “awareness that the agency was being asked to do this [and] was going forward on it. … [and having] visibility into some of the activities there.” Again, on the basis of the fundamental principle of need-to-know, Brennan would have had zero “visibility” into the highly sensitive torture program, were Tenet not to have wanted him to be involved or, at least, kept informed about it. If CIA officials wrote memos on the sensitive issue of torture, it seems altogether possible that they wrote memos about warping intelligence, too, while restricting dissemination to those with a need-to-know. You may wish to try to get ahold of any such memos, in order to determine if either the “loop” or the “chain” included Brennan. By no means were you the only Congressperson to fall for what Lawrence Wilkerson, Colin Powell’s chief of staff at the State Department, has branded the “hoax” on Iraq. But you are now chair of the Senate Intelligence Committee. Would it be asking too much to request that you take greater pains to exercise due diligence, this time around, regarding those playing fast and loose with key intelligence judgments that can lead to war? First, please find out what evidence John Brennan is relying upon for his assertion that Iran is “bent on pursuing nuclear weapons and intercontinental ballistic missile delivery systems.” Does he know something others should know? Or are we beginning to see the makings of another consequential hoax? Second, please look closely into the role Brennan played at his mentor’s side, as George Tenet corrupted the intelligence process to service White House lust for war on Iraq. See what you can find out. If it turns out that those conjuring up “uncorroborated, contradicted, or even non-existent” intelligence kept Brennan in the loop (as the torture aficionados did), the fact that Brennan did not blow the whistle is enough, in our view, to remove him from consideration as CIA director. You began Brennan’s confirmation hearing by stating that the number of civilian deaths caused by US drone strikes each year has “typically been in the single digits.”â€¨â€¨ This brought to mind the extraordinary public claim Mr. Brennan made on June 29, 2011, that “nearly for the past year there hasn’t been a single collateral death” as a result of CIA drone strikes in Pakistan. Could Brennan have forgotten the widely reported drone strike just three months earlier (on March 17) that killed 42 Pakistanis, most of them civilians? Could he have forgotten the strong protest that the Pakistani government lodged decrying those killings in the town of Datta Khel? Just two days ago (February 20), Sen. Lindsey Graham publicly put at 4,700 the total number of those killed by U.S. drone strikes in the past decade. This is the first time a United States official has provided a casualty figure for U.S. drone attacks. Interestingly, Graham’s estimate is very close to the high side of the estimated range given by the UK-based Bureau for Investigative Journalism for “total reported killed” in Pakistan, Yemen, and Somalia: 4,756. What does John Brennan say about these inconsistencies? Have you checked back with those who told you the annual kill-rate for civilians has “typically been in the single digits?” We suggest that you ask Mr. Brennan to try to resolve these discrepancies before your committee takes further action on his nomination. First of all Dianne Feinstein, is a ZIONIST JEWESS ,amd her loyalty is not to the protection of America,her loyalty is for THE FASCIST STATE OF ISRAHELL, every vote that she cast is always to the detriment of the united states citizens, like all the rest of her kind, that have been elected to desmantle our republic,either by war and all its spendituares, of by abortion, to stop america from renuewing, its population. the jewish philosophy is ISRAHEL FIRST AND TO HELL WITH THE REST OF HUMANITY. MY QUESTION IS WHO IS VOTEING THESE CRIMINAL INTO OFFICE EVERY 6 YEARS, WOULD THAT BE ZIONIST HOLLYWOOD AND ALL THE PARASITES THAT REPRESENTS IT ? So dont’t expect any changes on her way of thinking a jew only works for the jews not foar the non-jews. The antisemites are loose again. All of the commentators that believe the fix is in and that Feinstein will get away with it may be right, especially with a public that is uneducated, uncritical in its thinking, generally uninformed, and conned on these issues. But still, you have to keep hammering away, and building a record while doing so, and who would have better credibility in these matters than VIPS? Re: Feinstein, one knows something of her political history, her ties to the Shorenstein interests in SF (Walter was her political mentor), her position re: Israel and the Middle East, her husband’s business interests, their questionable conflicts of interest, and hers and her husband’s position in the Bilderberg pecking order. But, notwithstanding all of this, one wonders, why would a 77-year old woman in her twilight years not still try to make the rest of her life purposeful? Is she, as F.G. posits, consumed by those “four subsets of human behavior”, and should redemption count for so little? And a question for Rehmat, where in heavens name did you come up with “David Cohen” as the “real” George Tenet? I just want to say, Thank You guys. You folks are doing a great thing by using your voice and expertise to voice things that a lot of us little people will never have heard if we spoke it ourselves. Thanks for that. So grateful, beyond words. You may be sane, but you’re not very smart. Surely you know by now, once the US has decided to steal someone’s oil or other key natural resources, it’s a done deal and there’s nothing we won’t do to see it done. So what if we lie as long as if suits our purposes? We don’t even have to tell you anything if we don’t feel like it. So ask yourself, “Is John Brennan a loyal servant to the rulers of the free world?” We’ve answered that question already. Sleep tight. Incredibly enough, despite the US intelligence finding that Iran does not have an active weaponization program, the media propaganda has gotten nearly 100% of Americans to believe that Iran is a bigger threat than the USSRâ€™s nukes during the Cold War or North Koreaâ€™s actual nukes. Itâ€™s reminiscent (but even worse) of how they got 70% of Americans to believe that Saddam Hussein was behind 9-11. How do we make a dent in the mainstream media that is part of the propaganda machine? The unbelievable degree of effective manipulation of US citizenry in the US effectively means the politicians and their military industrial complex can do absolutely anything they want in the short term without fear of public accountability. In this brave new world, facts donâ€™t matter. Only public perception based on proven effective sales techniques is important. That Gallup poll produced results similar to the plebiscite conducted after the anschluss of Austria. The bright side is that Austria now realizes the error in its blind allegiance. 50 million people had to die before that happened, but better late than never? Hope springs eternal in the human breast. THE MASS MEDIA IS THE MOST POWERFULL WEAPON ON THE HANDS OF CRIMINALS THAN ANY NUCLEAR ARSENAL, BECAUSE IT WON’T KILL HUMANITY BY SURPRISE, BUT BY STRESSING IT TO ITS LIMITS,AND THE JEWS OWN 96% OF THE MEDIA WORLD WIDE, THAT IS WHY THEY HAVE BEEN ABLE TO ADVANCE THEIR NEW WORLD ORDER AGENDA AGENDA WITH OUT FIRING UNESESARY SHOTS TO HUMANITY, AND THEIR OBJECTIVE IS THAT BY DECEPTION WHICH IS THE WEAPON OF CHOICE MORE USED BY THE JEWS, TDHE CAN ALMOST SEE THEMSELVES RULEING THE WORLD AS (little gods) THEY TRY TO ASEMBLE THEIR WORLD GOVERMENT FOR CENTURIES, NAPOLEON, HITLER, WERE JUST ZIONIST JEWS THAT WERE USED AS TOOLS, GOING ABOUT THEIR CONQUEST BY FORCE OF A RIFLE, BUT THEY LEARNED, THAT BY INDOCTRINATION THEY CAN BRAIN WASH ALL THOSE THAT HAVE NO PROTECTION FROM GOD SINCE THEY DO NOT HAVE THE HOLY SPIRIT AND TURN THEM INTO USEFULL IDIOTS LIKE GLENN BECKK,WHILE THE OTHERS SOME OF THEM JUST CHANGE THEIR NAMES TO APEAR LESS JEWISH, LIKE RONALD LEVI, BETTER KNOWN AS RUSH LIMBAUGH, THAT CONTROLS OVER 20 MILLION MINDLESS IDIOTS THAT EVEN WOULD BE WILLING TO KILL FOR HIM, IF AMERICANS WERE IN FELLOWSHIP WITH CHRIST, INSTEAD OF WITH THEIR FALSE PASTORS AND TEACHERS , THEY WOULD BE AWARE OF THE DANGER THAT THE ZIONSIT JEWISH CRIMINALS HAVE IN STOARE FOR THEM, NO OTHER RELIGION OR TRIBE HATES CHRISTIANS MORE THAN THE JEWS THEMSELVES DID THEY NOT KILLED OUR LORD AND SAVIOUR JESUS CHRIST JOHN 8:44-ON SAYS YE JEWS ARE OF YOUR FATHER THE DEVIL, YOU ARE NOT MY SHEEP, AND YOU ARE NOT OF GOD. HOW MUCH CLEARER COULD OUR LORD JESUS SAY IT. I have to agree with Rehmat. This is a serious waste of time. Feinstein is known to us in San Francisco of being one of the most corrupt politicians since Hermann Goering. Anyone who thinks she seriously would impede anyone trying to gin up a war with Iran is delusional. Many members of our government merely tow the Israel lobby company line because it is expedient. It’s a way of demonstrating their â€œbona fidesâ€, if you will. The obsequious boot-licking during the Hagel hearings revealed the unvarnished truth about where, but not necessarily why, their loyalties align them. We hear much about the â€œOne Percentâ€ wealthy, whose influence based on profit motives steers the affairs of state. Many of them are deeply financially involved in corporations that profit from military adventurism, and they stand to benefit whether we win or lose the wars they start. Coincidentally, many of them are members of Congress. People like Nancy Pelosi and Diane Feinstein posses wealth many orders of magnitude greater than what could be considered â€œmiddle classâ€. Beyond expedience and personal gain, there are no doubt the â€œtrue believersâ€, whose ideological, cultural and religious precepts align them with a rationalized motive for pursuing Israeli, rather than American foreign policy interests. Some people, despite (or perhaps because of) an inherent lack of scruples, become society’s over-achievers. As Martha Stout points out in her revealing book, lack of conscience is not an impediment to success. I would suggest that anyone who has bothered to read this comment ask themselves, â€œWhere before has history demonstrated so clearly the intersection of these four subsets of human behavior: expedience, self-aggrandizement, lack of scruples and fanatic devotion to an ideologyâ€? Every example you can name is a study in disaster. I’m very grateful that V.I.P.S. has taken their responsibility to our democracy seriously enough to try and influence the outcome of these hearings with this letter. But I am afraid it will fall on deaf ears. It is addressed to someone who reminds me more than anyone else in recent memory of Madelaine Albright, whose comment regarding 500,000 dead Iraqi children was, â€œIt was worth itâ€. Lying within the intersection of so many impregnable motivations is a subset of determination that will not yield. Fear plays a significant role as well. Weakness and lack of courage favor the choice of a ruthless protector. I suspect that that, as much as anything else, will influence Ms. Feinstein’s conduct of these hearings. One other point, this one relating to North Korea. The country was under Japanese occupation for 50 years, and when finally in the post WWII transition, when it had a chance for free elections- the country was temporarily split under the Soviet and U.S. mandates- we managed our ours in the South to exclude any number of populist parties from participating, thereby choreographing a Syngman Rhee victory, following which his gangsters proceeded to slaughter the opposition. It didn’t help with the people, that Rhee installed in his government and army Koreans who had collaborated with the Japanese. As for the North, during the Korean War we bombed literally every city into the stone age, which greatly endeared them to the U.S., and meant that if they were going to defend themselves they would have to build their defenses below grade deep in the bowels of the earth and develop weapons and a weapons delivery system that would keep the likes of Brennan off their turf. This is not to advocate for any side, but it does seem that our own provocations have not been particularly productive. This one is hugely important, and one hopes Di-Fi will not try to exclude it from consideration, as she has tried with other testimony and witnesses in this confirmation hearing, and on legislative hearings.